In terms of job opportunities as well, Diploma candidates face a handicap. 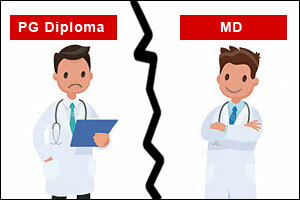 As per MCI norms, diploma candidates cannot apply for academic positions at medical colleges. Earlier, they were allowed to work as senior residents at medical colleges, but after June 2017 notification, even this option has been taken away. Existing Diploma senior residents can, however, continue at their existing posts as per MCI. Abolish diploma courses because the only difference between diploma and degree is duration of the course (One-year difference) and submission of thesis report. Both students trained by same colleges with same infrastructure. Instead of Diploma course increase number of degree seats that will increase number of teaching medical professionals. Medical professionals already qualified Diploma courses worked in the teaching hospitals for Two years should be given degree after submission of Thesis report. MCI on its part, noting the issue at hand decided to stop all MCI recognised postgraduate diploma courses in Medical colleges and give equal number of MD/MS seats in return to the medical colleges. The decision, which is being applied prospectively is indeed going to benefit the future generation of specialists but leaves behind thousands of doctors who are holding MCI recognised Diploma Degrees but do not have any avenue of career progression. Responding to the plea, the Health ministry has now asked the newly appointed MCI Board of Governors to look into the matter. Please do something for the doctors who have already passed the pg diploma examination..
diploma holders are like sc/st in the society of medical world.They have done equal no of teaching,labour ,duties ,and work as MS/MD students. MCI should give them a chance to do a thesis work and once the thesis is accepted they must be awarded respective degree. i too am a MCI recognised PG diploma DPB (CPS) holder working in govt. medical college since 2002. Please include me in the group of PG Diploma doctors.